In our modern world, horses make their name in the realms of equestrian sports and thoroughbred racing. In the nineteenth century, they were vital means of transportation, agriculture, warfare, and power generation. However, early horses were nothing like Barbaro or those of little girls’ dreams. These truly wild horses were much more aggressive than modern Przewalski horses (the closest modern examples of prehistoric horses), which are already difficult to manage and nearly impossible to train as mounts. 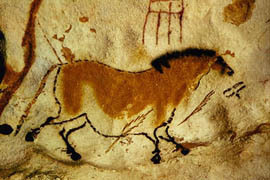 Instead, early horses were seen as a food item: large game to be hunted. Why did humans first decide to domesticate these wild creatures? When and where did this happen? How did the process of equine domestication develop? For most of human history, horses were seen as prey to be hunted for sustenance. During the late Pleistocene, around 55,000 years ago, Neanderthals scavenged off of horse carcasses and made occasional kills of their own. The upper Paleolithic, 35,000-10,000 years ago, marked the arrival of fully modern humans with considerable linguistic capabilities and increasingly complex weaponry. At this time, evidence for communal hunting can be found in Solutre in east-central France where 32,000-100,000 horses were killed at a communal hunting site (Olsen, 43-44). Furthermore, recent studies have shown that human predation may have been a major factor causing the near extinction of the species. In North America, both hunting pressures and climate changes at the end of the Ice Age caused the extinction of 35 genera of megafauna (mammoths, mastodons, stagmoose, giant elk, saber-toothed tigers, and equines). Horses would not return to North America until Columbus brought domesticated herds in his second voyage in 1494 (Budiansky, 40). Viewed as a source of food for tens of thousands of years, humans began the steps towards domestication in order to fulfill that need. The original purpose for domesticating prehistoric horses was to obtain a relatively low maintenance source of meat. During the early Holocene, up to 8,000 years ago, human populations began to change from hunter-gatherers to farmers. At the end of the Ice Age, it became harder to preserve meat and large game were becoming scarce, thus resulting in the shift to early animal husbandry (Clutton-Brock, 62). In contrast to sheep and cattle that were domesticated first, horses were capable of feeding themselves and better adapted to surviving in cold weather, therefore requiring less fodder and care. Determining the time and place of earliest domestication is still being debated and research continues to be conducted in the quest for a definitive answer. Unlike full domestication, which is evident in bridling equipment and artistic depictions of horses used as mounts or work animals, the transition to this final phase lacks such concrete evidence. There are no major anatomical differences between modern horses and their ancestors, and researchers are forced to rely on indirect evidence. Archaeologists and zoologists examine bone structure and look for modifications in prehistoric anatomy (such as changes in diet or breeding) that might signify activities associated with domestication (Anthony, 65). Though the exact time and location of early domestication is uncertain, it is clear that this progression towards full domestication was undertaken when humans began to exploit horses not solely for their flesh, but for their strength and speed. Domestication most likely first occurred in the Eurasian steppes where horses were best adapted to the open grasslands. Also, as the Ice Age came to an end and forest overtook grasslands, horses migrated to the remaining steppes of Ukraine and Central Asia (Budiansky, 40). In this region, horses were most plentiful and capable of playing a significant role in the economies and societies of humans after the Ice Age. One widely-cited estimate pinpoints the earliest domestication to Ukraine in 4500-3500 BC. At Dereivka, a Copper Age site home to the Sredni Stog culture, the percentage of horse bones found was three times higher than the average found in earlier sites (Anthony, 72). This signifies a great increase in the exploitation of horses and domestication. In addition, archaeological horse teeth from the site shows signs of bit wear, meaning the horse was regularly bitted in the months before its death (Anthony, 78). This provides further evidence of domestication, particularly for the usage of a horse as a mount. Archaeological finds also included evidence of trade with the Cucuteni-Tripolye culture 900 kilometers away (Anthony, 81). This illuminates the influence of full equine domestication on human culture, allowing long-distance trade and communication, movement of groups into more resource-abundant areas, and other social changes. Though the Dereivka hypothesis shows how humans gained immensely from domesticating prehistoric horses, the process of domestication still involved a two-way street. Like the relationship that developed between humans and dogs that had been living together for a long period of time, a similar “co-evolution” of traits (Wade) may have occurred between humans and equines. A mutual coevolution of both species’ traits allowed them both to benefit from their coexistence in the form of domestication. Similar to the wolves that benefited from venturing closer and closer to early human campsites, horses that also began to linger around permanent human settlements benefited from feeding off of agricultural fields and protection from predators. Those horses that became “semi-domesticated” were more curious, less aggressive, and more dependent over time and adapted to life around humans. Dogs held an advantage over other species in becoming man’s best friend because of their tameability, trainability, and superior skills in reading human cues (Wade). In comparison, horses had a anatomical advantage over sheep and cows in progressing past domestication for sustenance purposes due to their diastema, a gap between the front incisors and rear grinders which allows for the placement of a bridle and bit (Budiansky, 16). The horse-human relationship illustrates the great power humans have over the environment. For the majority of our past history horses were valued as a food source, so much so that over-predation led to their near extinction. During drastic climate changes and prey scarcity at the end of the Ice Age, prehistoric humans were able to manipulate their surroundings and begin taking the first steps towards equine domestication in the form of game husbandry. Just as humans were responsible for the previous near equine-extinction, equine domestication led to an explosive increase in the horse population at the time of the earliest domestication in Ukraine (Budiansky, 41). Humans were able to fully domesticate horse, exploiting its strength and speed for use as a mount and transport. Humans benefited as they were able to spread to different resource-rich areas and spread their culture, but horses also benefited in their shared history of coevolution. They gained protection and were provided food, and were also saved from extinction. The process of early equine domestication is the product of human-horse mutual adaptation and benefit. 1. Anthony, David W. “Bridling Horse Power: The Domestication of the Horse.” Horses Through Time. Boulder: Roberts Rinehart Publishers, 1996. 2. Budiansky, Stephen. “The Nature of Horses: Exploring Equine Evolution, Intelligence, and Behavior.” New York: The Free Press, 1997. 3. Clutton-Brock, Juliet. “A Natural History of Domesticated Mammals.” Cambridge: Cambridge University Press, 1999. 4. Olsen, Sandra L. “Horse Hunters of the Ice Age.” Horses Through Time. Boulder: Roberts Rinehart Publishers, 1996. 5. Wade, Nicholas. “From Wolf to Dog, Yes, but When?” New York Times. 10/22/02.